Hello people of the internet!!! On today’s ‘YouTube Wednesday’ we’re going to talk about something a little different than what we usually discuss. This year has definitely been a HUGE year for YouTubers. Many of our fav internet celebrities have gotten book/movie/TV/deals, scored magazine covers, and so many other amazing traditional media opportunities. One of the most recent accomplishments that a lot of YouTubers can add to their resumes, is the honor of being added to Madame Tussauds’ Wax Museum. This is an INCREDIBLE win for Team Internet that will definitely change up the game for everyone. So now let’s get to the fun part! Ready? Ok, let’s go!!! 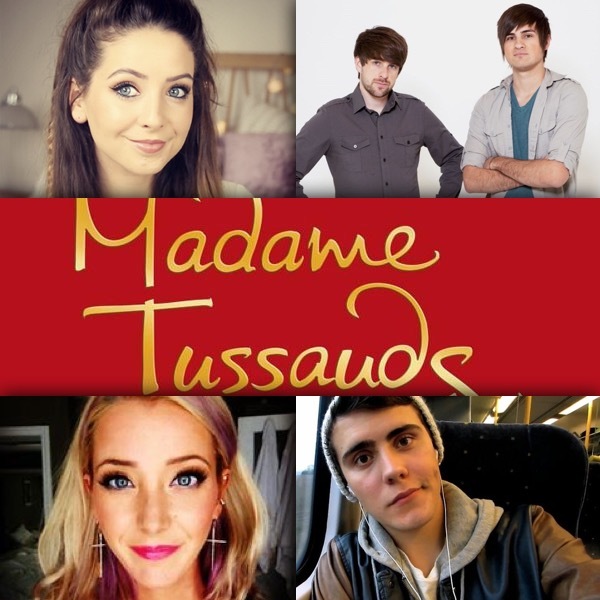 In the past few months, we have found out that vloger Alfie Deyes, beauty guru/blogger Zoella, and comedians Smosh and Jenna Marbles would be receiving their own wax figures in Madam Tussauds’ museums. Honestly this is a HUGE accomplishment for them, because it places them in incredible company. This also continues to solidify the fact that in the past 10 years, YouTubers have gone from “kids making videos in their bedrooms”, to actual respected entertainers, and moguls in their respected fields. Now if for some reason you don’t know who Madam Tussauds is, then you definitely need to keep reading because you will become OBSESSED with this awesome museum. Madam Tussauds’ Museum first opened in London 200 years ago, and has since opened branches all over the world. The museum & displays wax sculptures of some of the world’s most important political, sports, and pop culture figures. Some people that have gotten a wax figure include: Barack Obama, Abraham Lincoln, Princess Diana, Jennifer Aniston, Taylor Swift, Justin Timberlake, Albert Einstein, Pablo Picasso, Muhammad Ali, Marilyn Monroe, and so many other amazing people. Needless to say, once you get one of these wax figures you are instantly added to a secret club of awesomeness. I can’t wait to see what types of opportunities YouTubers continue to receive, as the internet and traditional media continue to built off of each other. All credit goes to YouTube, Zoella, Zoe Sugg, Alfie Deyes, Jenna Marbles, Smosh, Madame Tussauds’ Wax Museum, Madame Tussauds, Barack Obama, Abraham Lincoln, Princess Diana, Jennifer Aniston, Taylor Swift, Justin Timberlake, Albert Einstein, Pablo Picasso, Muhammad Ali, Marilyn Monroe, and any and all companies, individuals, and/or businesses that should receive credit for anything mentioned in this blog post, and all other original owners. I do not own anything in this blog. If any people, corporations, businesses, companies, etc, were not previously given credit for their work, they are given credit now and their previous absence was unintentional. All opinions expressed in this blog are my own. I wrote this blog for entertainment purposes and no copyright infringement is intended. celindareyesblog July 30, 2015 No Comments on YouTube Wednesday: Some of our fav YouTubers have reached a new level of awesome. Category: YouTube Wednesday. Tagged: Abraham Lincoln, Albert Einstein, Alfie Deyes, art, Barack Obama, beauty, book, celebrity, comedy, duo, entertainment, fashion, guru, icon, internet, Jenna Marbles, jennifer aniston, justin timberlake, Madame Tussauds, Madame Tussauds' Wax Museum, Marilyn Monroe, movie, Muhammad Ali, music, new, pablo picasso, podcast, Princess Diana, Smosh, taylor swift, tv, youtube, Zoe Sugg, zoella. Monday Memos Artist Spotlight: Why 2014 Is Going To Be A Golden Year for Bruno Mars! Home | Monday Memos | Monday Memos Artist Spotlight: Why 2014 Is Going To Be A Golden Year for Bruno Mars! Hello people of the internet!!! On today’s ‘Monday Memos’, we are going to do an ‘Artist Spotlight’ on the AMAZING performer Bruno Mars. Ready? Let’s get started! Over the years, there have been many artists who enter the music industry with talent and charisma, who instantly steal our hearts and souls. However, every once in a while, an entertainer emerges who is so phenomenally special, that they rise above the others, and leave us in awe of their musical abilities, Bruno Mars is one of these entertainers. Bruno Mars (whose real name is Peter Hernandez) was born on October 8th, 1985 in Honolulu, HI. At the tender age of two, he began performing throughout Hawaii, and by four he was performing shows five nights a week. Bruno has stated that his father moved to Hawaii from Brooklyn and began a group called ‘The Love Notes’, who sang 1950’s doo-wop and did impressions of Little Richard, Chuck Berry, Jerry Lee Lewis, and Elvis Presley. As a young boy, Bruno began performing with this group, and did an Elvis impression. After he completed high school, Bruno moved to Los Angeles, CA in order to continue his musical pursuits. Upon moving to Los Angeles, Bruno worked with many undiscovered artists, such as Ne-Yo (who later wrote a hit song for the artist Mario, and has since become a huge star as well). Bruno has stated that he learned the importance of songwriting by watching how Ne-Yo wrote music. Bruno realized at that moment that he wanted to learn how to properly write songs, in order to (as he has stated to ’Vibe Magazine’), “…be respected for the songs that I write.” Bruno worked on his writing skills, and at the age of 18, he received a recording contract with the legendary ‘Motown Records’. Unfortunately, Bruno was later released from his contract due to creative differences, and he moved back to LA and continued to pursue his musical ambitions. He soon began working with songwriters/producers Phillip Lawrence and Ari Levine, and the trio soon became a highly sought after team called ‘The Smeezingtons’. Bruno soon began writing songs for popular artists, and in 2006, he met with Aaron Bay-Schuck (who at the time had just left his A&R position at Epic Records). Aaron (who later became Bruno’s manager); soon took a job at Atlantic Records, and wanted to sign Bruno immediately. However, Atlantic Records thought that Bruno was not ready yet, so Aaron kept The Smeezingtons on as songwriters and producers for the label. In 2009, Bruno was finally signed by Atlantic Records as a solo artist, and immediately began writing hits for artists such as Travie McCoy, Flo Rida, and B.O.B (Bruno lent his vocals to Travie McCoy’s song ‘Billionaire’, and B.O.B.’s song ‘Nothin on You’, which was his first real exposure as a solo artist). In May of 2010 Bruno released his E.P ‘It’s Better If You Don’t Understand’, which peaked at #99 on the U.S. Billboard 200 chart. In August of the same year, Bruno co-wrote Cee Lo Green’s hit track ‘Forget You’, which was a huge hit for both artist (although Bruno did not sing on the track). Bruno’s debut full length album ‘Doo-Wops & Hooligans’ was released in October of 2010, peaked at #3 on the U.S. Billboard 200 chart (and also peaked extremely high in numerous other countries, causing the record to be a vast improvement from his EP). Doo-Wops & Hooligans received a total of seven Grammy nominations in 2011 & 2012, and won in 2011 for ‘Best Pop Vocal Performance for the single ‘Just the Way You Are’. In 2012, Bruno released his second album ‘Unorthodox Jukebox’, which peaked at #1 on the U.S. Billboard 200 chart, and garnered Bruno five Grammy nominations in 2013. Bruno’s music has earned him international fame, and has been used in numerous commercials, as well as covered on the popular U.S musical-comedy ‘Glee’. Bruno is scheduled to perform at the halftime show of the 2014 U.S. Super Bowl, and honestly is most likely going to put on an amazing show. As you can see, Bruno has had a very long road to achieve his fame and acclaim as a vocalist/songwriter/producer. Although he his past three years have been phenomenal, I think that 2014 is definitely going to be Bruno’s golden year. I anticipate him doing very well at the Grammys, and possibly even releasing another album by the end of this year, or in early 2015 (and we all know when he does release another album, it’s going to be musical perfection). Honestly, the Super Bowl Halftime Show is arguably the biggest event for an artist to perform at, thus Bruno’s invitation to perform there, proves that he is now recognized as one of the top musicians, currently in the industry. I anticipate that Bruno will only become more famous and will one day become a musical icon, just like the artists that he idolized as a young boy in Hawaii. celindareyesblog June 22, 2014 No Comments on Monday Memos Artist Spotlight: Why 2014 Is Going To Be A Golden Year for Bruno Mars!. Category: Monday Memos. Tagged: 2013, 2014, 2015, 2nd album, album, atlantic records, b.o.b, best pop vocal performan…, billionaire, brunomars, california, cee lo green, chuck berry, debut album, doo-wops & hooligans, elvis presley, entertainer, ep, flo rida, forget you, glee, grammy, hawaii, icon, industry, jerry lee lewis, just the way you are, leamichele, little richard, los angeles, magazine, motown records, music, musical, musician, ne-yo, nominations, nothin on you, performance, performer, pop, popculture, producers, record, solo artist, songwriter, soul, super bowl, talent, track, travie mccoy, undiscovered, unorthodox jukebox, vibe, vocalist, wins. Hello people of the internet!!! On last night’s (November 24, 2013) AMAs, A LOT of stuff happened. Ok, ready? Let’s get started! This year’s AMAs were hosted by Latin rap superstar Pitbull, who certainly seemed to be appreciative of his hosting gig. Pitbull said that it was a miracle that he was hosting the award show, and that he was living the American dream. Although Pitbull’s opening monologue was short, he did make a pop culture reference when he asked several female dancers to come on stage to twerk for the crowd. He also explained that twerking was not a new concept, and stated various names that twerking has been giving, previous to Miley Cyrus adopting the dance. With the tremendous success of his latest 2 part album ‘The 20/20 Experience’, it’s obvious why Justin tops pop this year. Once again Rihanna proves why she is an unstoppable force in the music industry, by adding yet another award to her long list of achievements. The golden girl strikes again (and no I was not referring to her hair color) ! The first award that Taylor won last night was so appropriate and well deserved. This team has had an iron claw on radio since their song ‘Thrift Shop’ made thrift stores cool (now you know you want to go to a thrift store and just start rapping…yes you do, don’t deny it!). They have had similar success with their numerous other tracks such as ‘Same Love’ and ‘Can’t Hold Us’, so it’s obvious why they would take this award home. One thing that keeps this band on top is their constant habit to always evolve musically. Even though they had us hooked when their hit song ‘It’s Time’ first hit the airways, Imagine Dragon has continued to push their musical capabilities with their equally infectious tracks ‘Radioactive’ and ‘Demons’. For the past few decades Marc Anthony has been an icon in Latin and mainstream music, so it’s not surprising that fans still love him. C’mon was it ever a question that this super group would win! Since their U.S. debut in 2011 with the smash ‘What Makes You Beautiful’, this boy band has had an iron grip on the hearts of U.S fans. This was One Direction’s first AMA, and as if that wasn’t special enough, they were the only British group of the night to win an American Music Award. This powerhouse vocalist has been compared to many iconic female vocalists, and if this year is any indication, she will have a very long and successful career. At only 20 years old, Ariana has had a role on a successful Broadway musical, has been on two highly successful TV shows, and has had a number 1 album. So this is a girl you should definitely keep your eye on, and if you haven’t, pick up her debut album ‘Yours Truly’. At the ripe old age of 25, super star Rihanna won the 1st ever Icon Award last night. With many accolades which include: six Grammy Awards, 12 number one singles, and the honor of being Billboard’s highest selling digital artist of the 2000s, it is obvious to see why Rihanna is a musical icon. The award was made extra special because Rihanna’s mother presented the award to her (Ok, everyone say AWWWWWWW! ), so last night was a good night to be Rihanna, good job girl! Since 1993, when a fresh faced young boy named Justin Timberlake appeared on ‘The Mickey Mouse Club’, he has had full control of the hearts of fans. From his time as a member of the highly successful boy band N’ Sync, to his even more successful solo career, Justin’s iron grip on the music industry has only tightened with age. And I have to say that it was so funny when Justin won, he walked over to Taylor Swift and started mouthing “Oh my god, oh my god” (yes, my words exactly Justin). Ok, for 1 minute we’re going to pretend that this was a surprise…ok minute over now back to the blog. Well, Taylor had such a successful night last night, adding 4 more awards to her large collections (Have you ever wondered how many award shelves she must have?). This cross-over track has controlled mainstream and country radio for the last year, and has turned country duo Florida Georgia Line into a household name. With all of this considered, it makes perfect sense that this song won the AMAs first ever ‘Single of the Year’ award. Yes Justin Timberlake won again! (It was a good night to be Justin Timberlake! GO Justin GO Justin! ok my fangirl moment is over). This has been a huge year for electronic dance music, and Avicii’s mega hit ‘Wake Me Up’, featuring vocalist Aloe Blacc, has certainly put him in the fore front of the minds of music lovers. The country superstar has been burning up the charts, as well as celebrating a very successful year with a lot of awards. It seems that fans just can’t get enough of this rising king of country. Now when you say the words ‘favorite’, ‘pop’, ‘group’, you gotta think of One Direction. These guys have gone from reality show contestants to full-fledged pop superstars, and with the release of yet another #1 album, it’s obvious that there is no stopping these talented guys (good job Simon Cowell, we are forever in debt to you!). This group has had quite the year, from releasing a successful album, to performing with the legendary Stevie Nicks; this group is truly making their mark on music history. This award shows that Taylor’s music has now gone beyond genre restrictions, and that her fans now span an extremely large demographic. From their hit 2002 album ‘Songs about Jane’, this rock band has had the hearts and ears of fans worldwide. With front man Adam Levine’s participation on the hit NBC show ‘The Voice’, this band has only gotten more and more popular. This super star has been taking his fans “to church” ever since his award winning 2003 debut album ‘Happy’. Matthew has also written tracks for numerous Christian and mainstream acts (such as Rascal Flatts, Billy Ray Cyrus, and country music legend Vince Gill). Ok on the count of three everyone say YESSSSS. Ready? One, two, oh I can’t wait YESSSSS! You know you’ve been spending the past year quoting every line form this movie, and singing every song. So of course it would make sense that this movie is so successful I mean it brought us Fat Amy right?! You may now jump in the air and fangirl…ok time’s up. Katy Perry kicked off the show with a performance of her hit song ‘Unconditionally’. The performance had a Japanese theme, complete with Katy and her dancers wearing beautiful, multicolored kimonos, and dancing with fans. The screens behind Katy had visuals of Japanese lanterns rising up, which helped the overall effect of the performance. There was also a Zen garden on the stage, and midway through the performance, Katy danced with an umbrella as strobe lights shined around her. The performance ended with confetti falling from the ceiling, as some of the dancers did acrobatic tricks in the air. Katy then ascended the stairs, a smoke screen emerged, and then Katy disappeared. A very cool way to end a performance if you ask me! Next up was the super group of the moment, One Direction. The guys sang the track ‘Story of my Life’ one of the singles off of their latest hit record ‘Midnight Memories’. The staging consisted of several small light bulbs which resembled candles, and gave a very intimate feel to the performance. The guys mostly stood still during their performance, but in typical 1D fashion, they looked as if they were singing to every individual girl in the audience. Such a solid performance by the guys on their big night! Ariana Grande was the next performer, and even though she tweeted that she was extremely nervous about her performance, she certainly didn’t show it. Ariana sang a very small portion of her hit song ‘The Way’, and then dove into a full rendition of her 50’s inspired hit ‘Tattooed Heart’. The throwback style performance was made complete with 4 backup singers, who all sang with old school 50’s style mics (you know the one’s that can’t be taken off of their stand, but look really cool. Oh and Ariana also sang with this kind of mic, so it made her performance that much more authentic). When Ariana finished performing, she received a standing ovation, and it was definitely deserved, because her voice was so strong and precise, despite the fact that she has been performing A LOT…don’t you wish you were this amazing? I sure do! Imagine Dragons were up next, and they definitely brought the rock and roll with them. Their set started with their newest hit ‘Demons’, which included cool blue lights and a lot of smoke on the stage. They then transitioned into their song ‘Radioactive’, which included red lights and yeah you guessed it smoke! At another part of the performance, all the members of the band had a drum solo, so that was so different and cool! The man of the honor was up next…yup you guessed it Pitbull! Pop star Ke$ha joined him on their hit song ‘Timber’ with several dancers on stage with them. The staging consisted of two staircases, and there was a lot of really cool fire shooting all over the stage. The pressure was definitely on for Pitbull to deliver on this performance because of his job as host, and….he delivered. Two thumbs up! Justin Timberlake was up next and as always he delivered. JT sang the track ‘Drink You Away’, one of the songs off of his album ‘The 20/20 Experience’. He introduced himself as Justin Timberlake and the Tennessee Kids, and the band included several backup singers, and instrumentalist. Justin also played the guitar during his performance (he sings, dances, acts, writes music, plays guitar, seriously what can this guy not do!). The performance once again proved that this super star isn’t going anywhere! Country duo Florida Georgia Line performed their infectious cross-over hit ‘Cruise’ with hip hop star Nelly next. All three guys did an amazing job performing the song, and once the song was completed, they transitioned into singing Nelly’s 2001 hit ‘Ride wit Me’, which was unexpected, but was also a very cool transition. Since Florida Georgia Line and Nelly have been performing this song on award shows all year, it was nice to see them do something different with this performance. AMA Icon award .winner Rihanna performed her super hit ‘Diamonds’ next, and she definitely “shined bright like a diamond” (I’m sorry I had to say it). Rihanna wore a beautiful black dress, a pearl chocker, pearl barrettes, and diamond earrings, which made her performance, look very elegant. Between the stunning ensemble that Rihanna wore, and her incredible vocals, Rihanna proved that she is a musical icon! Next up was Macklemore & Ryan Lewis, who performed live from Miami via satellite feed (don’t you just love technology!). The two performed their latest hit ‘Can’t Hold Us’, and their staging had lights of various colors, and some of the lyrics appeared on the screen behind them. They brought a lot of energy to their performance (as always! ), and proved why they deserved such a great year (because c’mon, 2013 was a very good year for these guys!). Multi-talented superstar Jennifer Lopez performed next, with an amazing tribute to late Cuban superstar Celia Cruz. JLo performed a medley of some of the late superstar’s hit songs. Her performance showcased numerous dancers doing many Latin style dances, and JLo (who had 3 quick changes during the performance) proved that her dancing skills haven’t lost a beat during her many years in the industry. She did many difficult dances, including one move at the end of her performance where she was lifted into the air by her partner, and ended in a plank position above his head. This performance was actually my favorite of the night, you gotta love her. Great Big World and Christina Aguilera performed their chart topper ‘Say Something’ next, and it was pure magic. My favorite thing about their performance was the fact that the two acts have such distinct voices; however their voices still blend together so perfectly. Hip Hop artist Kendrick Lamar performed his hit track ‘Swimming Pools (Drank)’ next and showed that he is one to watch in hip hop. The artist is currently opening for Kanye West, and his performance at the AMAS last night demonstrated that he won’t remain an opening act for very long. Country superstar Luke Bryan performed his hit ‘My Kinda Night’ next, and he certainly received a warm welcome form the crowd. The back screen behind Luke had a ring pattern that grew and then collapsed (it sort of reminded me of a screensaver, it was really cool). The staging also consisted of lots of red and white lights, and of course included Luke’s signature dancing. All in all it was a very fun performance, that made you wanna get up and dance. Iconic R&B group TLC made a special appearance next, and performed their hit ‘Waterfalls’ with the assistance of rap/hip hop artist Lil’ Mama. The group performed all of the original dance moves from the ‘Waterfalls’ music video, and Lil’ Mama did an excellent job performing the rapping segment of the song. At the end of the performance, the back screen showed a photo of the late Lisa “Left-Eye” Lopes, which was a beautiful touch to the performance. The performance itself was amazing, and showed just how great T-Boz and Chili are, due to the fact that they can still perform the iconic song with such precession and skill, even after all these years. So all in all, the AMAs were full of exciting moments and amazing musical numbers. The show definitely did not disappoint, and made me excited for next year. All photos and information used in this blog belong to all those who have any part of the production, conception, implementation, or are in any other way involved with the AMA awards, Pitbull, Justin Timberlake, all those involved in the production, conception, implementation, or are in any other way involved with the following albums or singles: The 20/20 Experience, Red, The Heist, Take me Home, Songs of Jane, Thrift Shop, It’s Time, Can’t Stop Us, Yours Truly, Same Love, Radioactive, Demons, What Makes You Beautiful, Cruise, Wake Me Up, and Happy, Miley Cyrus, Rihanna, Taylor Swift, Macklemore and Ryan Lewis, Imagine Dragons, Marc Anthony, One Direction, Ariana Grande, The Mickey Mouse Club, N’ Sync, Nelly, Florida Georgia Line, Avicii, Aleo Blacc, Luke Bryan, Simon Cowell, Lady Antebellum, Stevie Nicks, Maroon 5, Adam Levine, Matthew West, Fat Amy, Rascal Flatts, Billy Ray Cyrus, Vince Gill, all of the individuals, labels, and other corporations associated with any and all artists, bands, groups, and individuals mentioned in this blog post, and all other original owners. I do not own anything in this blog. All opinions expressed in this blog are my own. I wrote this blog for entertainment purposes and no copyright infringement is intended. celindareyesblog June 22, 2014 No Comments on Monday Memos: 2014 AMAs Recap. Category: Monday Memos. Tagged: album, alternative rock, ama, american dream, ariana grande, artist, avicii, cant hold us, contemporary, country, cruise, debut album, demons, edm, favorites, female dancers, floridageorgialine, grammy, hip hop, hosting, icon, imagine dragons, inspirational, justin timberlake, ladyantebellum, latin, luke bryan, macklemore, male, marc anthony, maroon 5, matthew west, mileycyrus, monologue, music, nbc, nelly, onedirection, pitbull, pitch perfect, pop culture, pop rock, r&b, radioactive, rap star, red, rihanna, ryan lewis, same here, songs about jane, soul, soundtrack, take me home, taylor swift, the heist, thrift shop, twerk, wake me up, what makes you beautiful, winners, yours truly.